In the run-up to last year’s presidential and parliamentary elections in Zimbabwe, hope was palpable in Harare. Civil society activists, journalists, and business leaders marveled at how political space had opened up in the wake of the coup that ousted longtime President Robert Mugabe. It was as if an entire country had opened up the windows to let in fresh air. Citizens reveled in their ability to speak freely, and voiced their hopes that unconstitutional laws that had legitimized repression and restrictions on political and civic engagement would be repealed, so that the freedoms they were enjoying didn’t feel contingent on the whims of authorities. Today, President Emmerson Mnangagwa’s government is indeed taking action to address those laws, including the notorious Public Order and Security Act (POSA) and Access to Information and Protection of Privacy Act. These are welcome, long-sought reforms—and they are among the steps necessary for building the confidence that will unlock sanctions relief. However, these victories for Zimbabwe are ringing hollow because they occur against an alarming backdrop of state-sponsored violence and intimidation. In January, the state’s brutal response to popular protests killed seventeen and injured scores more. Within just the last week, two opposition members of parliament, Charlton Hwende and Joana Mamombe, have been arrested and charged with treason. 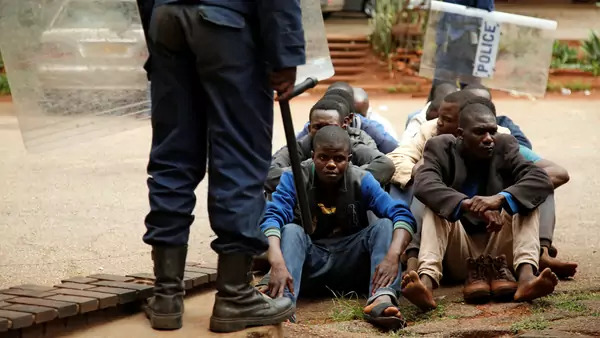 Authorities arrested prominent civic leaders, including Pastor Evan Mawarire and Rashid Mahiya, on similar charges. For Zimbabweans, the windows have slammed shut again. Whereas last year citizens experienced freedom without the legal framework to protect it, now it appears that Zimbabwe will be characterized by repression regardless of the law, helped along by a deeply compromised judiciary. The legal landscape may shift, but fear remains the constant organizing principle for Zimbabwe’s government.